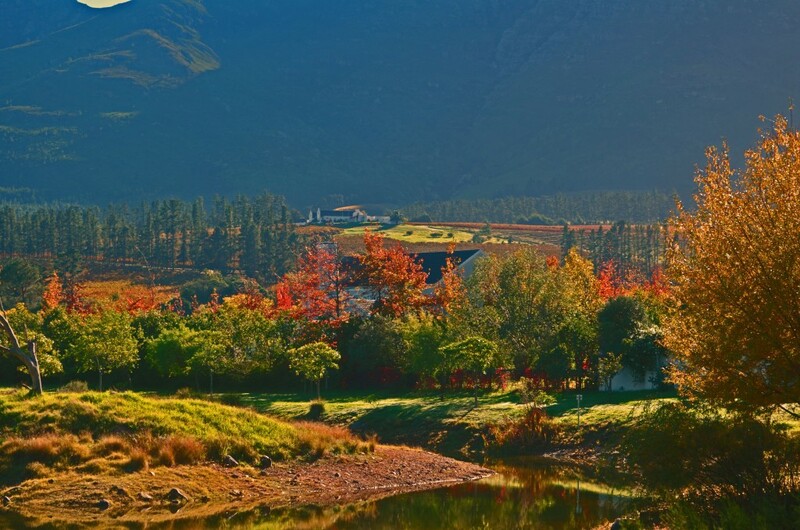 This is a picture I took during the fall season in Franschhoek, South Africa. This is perhaps one of the most beautiful places I have ever seen! Here it is! 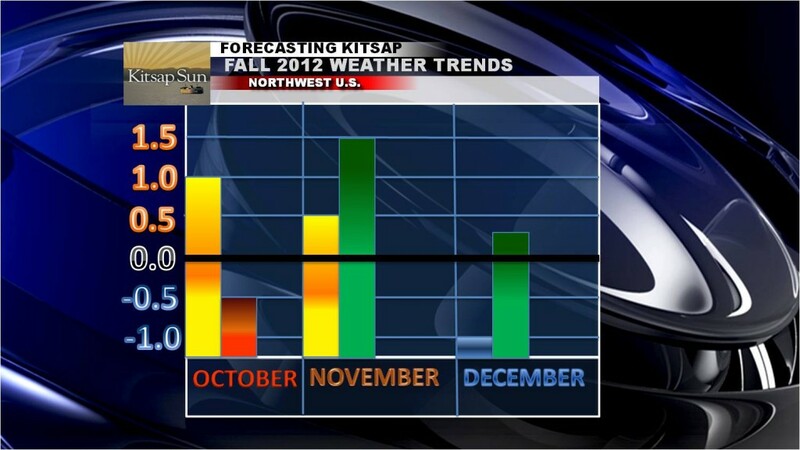 It’s taken me long enough, but I’m ready to release my official Fall 2012 forecast. I’ll issue my Winter 2012/2013 forecast in early December. As always, before the forecast begins, there are a few things to remember. It’s only a matter of time before someone comments: “Meteorologists can’t even forecast 5 days out, what makes them think they can forecast 3 months out?” There is a clear difference between climatic averages and daily weather forecasting. One expounds on year to year averages (climatology) while the other predicts specifics usually no more than two weeks out (weather forecasters). Click here to read more about the difference. In long range weather forecasting, some feel it is important to use analogs. Analogs are past years that exhibit some similar weather activity to the current year, and as a result weather forecasters try to match up the past with the present to see if there’s some type of correlation or pattern occurring. More often than not it’s just a guide, but sometimes history does repeat itself. 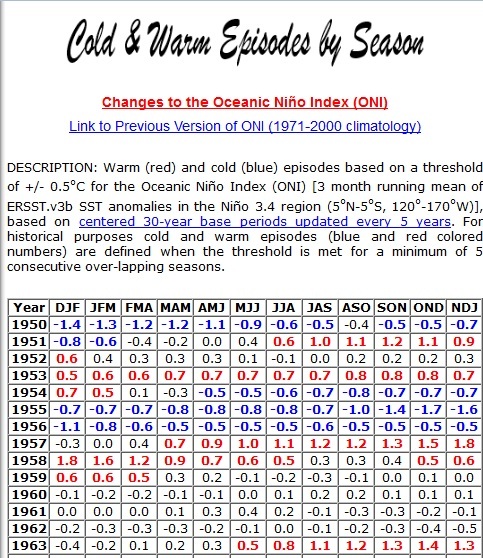 Other reliable pieces of data essential for producing a long range forecast is the ONI, or Oceanic Nino Index to track what El Nino, La Nina or neutral years in the past match up similarly to the present day. The records I have go all the way back to 1950. Solar activity can be another major factor to the weather over the years, but I haven’t weighted that heavily enough in my forecast mainly because of the lack of data. Lastly, I used the PDO readings (Pacific Decadal Oscillation) to finalize my findings. So with all the above points in mind, let’s get our hands dirty with some more specific, technical information. 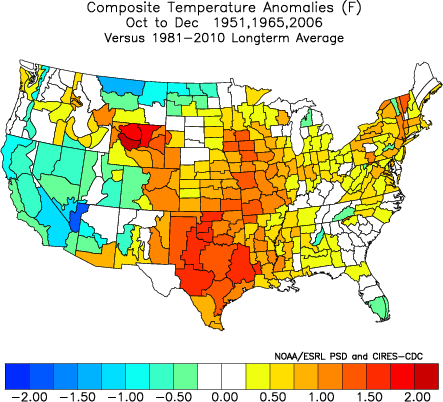 Again, the CPC analogs change every day, but these years have proven the most consistent. The PDO is the surface temperatures of the Pacific, north of 20° N. We are currently in a sharply cool (or negative) phase and we’ve been that way for almost 2 1/2 years straight! This plays a big part in our weather, so I set out to see which of the above analogs matched our current PDO phase (FYI, the PDO number for August was -1.93!) Although none of the analogs matched up quite to this years negativity, the remaining analogs seemed close enough, especially 1951 which registered a -1.37 reading in August. Whew! You’re still with me! Good for you! I hope you’ve learned as much as I have along the way. Long range forecasting is a fun, but tedious science. I consider myself a beginner, but the more I study and try my hand at long range forecasting, the better I expect to become. With that being said, my top 3 analogs for the Fall of 2012 in the Northwest is 1951, 1965 and 2006. I have weighted my forecast heavily as a combination of those three years, although it obviously won’t play out as a carbon copy. These analogs just provide me with a credible basis. 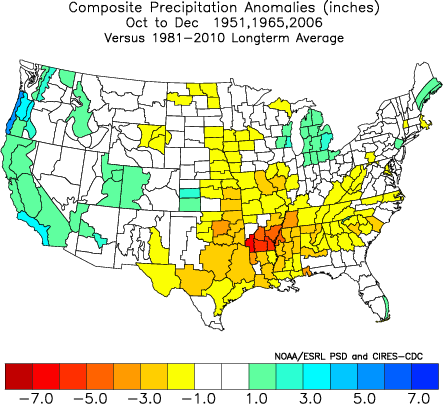 Also, just to note, the 1981-2010 temp/precip averages constitute what’s above, near or below average. 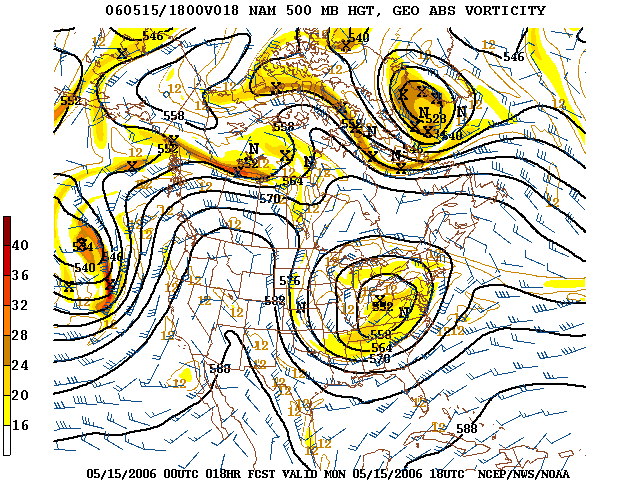 First off, here’s a composite map of my 3 main analogs. So right off the bat, it looks like from October-December this year, we have a decent chance of averaging slightly above normal in the temperature department and near normal to slightly above normal in the precipitation department. Contrary to a lot of fall forecasts out there, it just doesn’t look like the month for big temperature spreads or anomalies. Overall it looks like we’ll experience a much tamer and slightly warmer than normal October, on average. Expect the Cascades and Olympics to be seeing some snowfall this month as we could get several bouts with cold air, making the lowlands and the mountains chilly at times. Other than a few cold spurts, it’ll generally be a comfortable October, a month we usually have major wind or rain storms in. November will be our transition month. We’ll notice temperatures getting colder with many “first frosts” popping up around the peninsula. The most notable thing about November will be all the rain. Usually November is a wet month, but this year it’s projected to be quite wet. Temperatures will hover around normal for the month, but enough warmer, Pineapple Express-type rain storms could nudge the temperature up a tad. The jet stream will not have responded to the El Nino atmosphere quite yet, so expect a lot of cloudy, rainy days. The snow chance is up to 40%, meaning most of the month it will likely be too mild for snow, but we could have a few bouts of it towards the end of the month. 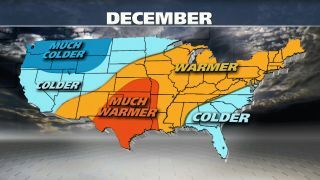 Even the research I’ve conducted corresponds well with a colder than average December. I’m not sure if I agree with the “much colder” than normal forecast put out by The Weather Channel, but either way it’ll be a chilly month. It’ll be drier than November, but still wetter than your average December. This will surely bode well for the mountains as well as lowland snow fans, as I see the very realistic potential for some arctic air intrusions/snow days during this month. It would be impossible to say how much, but with a forecast for above average precipitation, I’d say there’s a decent chance for SOME sticking snow. Well there you have it! It’s difficult and practically futile to predict any windstorms, snowstorms, ice storms, etc in these long range forecasts. All we need is a general idea of what it’s looking like all things considered. Of course there are other factors that play into our weather here, so it’ll be fun to check back and see how I did! Please feel free to use the comment section below or shoot me an e-mail about what you see. Have a great day everyone! Hello everyone! I’ve been meaning to issue a fall forecast of my own for the past couple weeks, but one thing has piled on another and I haven’t completed my draft! However, by Wednesday you’ll see the final results of what I am observing and what I think that will mean for you in the coming months. In the mean time, I thought many of you would like to know the Weather Channel’s take on the situation since, after all, they are slightly more well known, credible and famous than myself 😉 But I’d sure like to duel it out with them when it comes to predicting Kitsap’s weather! Ahem…where were we? Oh yes. The Weather Channel. In a news release just hours ago, Dr. Todd Crawford, Chief Meteorologist of Weather Services International (WSI), expounds on the ever declining El Nino and how it may actually play the opposite effect than first anticipated. This means much of the west could be caught in a chilly early season grip while the eastern states could bask in above to much above normal temperatures. As for us in the present day? Well…I don’t know how many ways I can present it to you without it sounds monotonous. 😉 The next 7 days looks pretty typical of late September: morning clouds, drizzle, partial clearing in the afternoon and highs reaching the upper 60s and lower 70s. This will be the case until about Thursday when a weak ridge of high pressure builds in and boosts temperatures up a notch into the low to mid 70s. I came across an incredible video yesterday that demonstrated one of the most exciting, yet common weather events in the Midwest called a microburst. In fact, these weather events are so rare in the Seattle area that I found only one news article highlighting that we’ve ever seen one in this region, and it was dated in the year 2000. So what are these strange weather events we call “microbursts”? Don’t let the prefix “micro” fool you into thinking this is a small deal. In fact, as you’ll see in a moment, it’s quite a BIG deal. Remember when we were going through that long series of thunderstorms in July? The most basic ingredients for thunderstorms are: moisture, unstable air and lift. This “lift” can usually form from fronts, ocean breezes or mountains. In our case, we had a lot of lift from the Cascades, as that is where these storms originated. Now, a microburst is one of the many demon children of thunderstorms (the others being hail, tornadoes, etc). 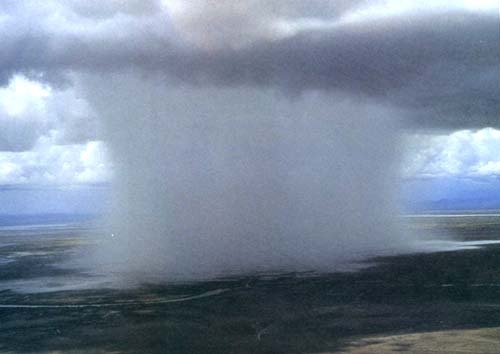 One of the most prominent meteorologists of all time, Ted Fujita, coined the term “microburst”, which is a downpour that can affect an area within a 2.5 mile diameter or less. (Ever heard of an “F-1” or “F5” tornado? The Fujita scale for measuring tornadoes came from him too!) A macroburst is anything larger than 2.5 miles. These microbursts can be described as rapidly sinking air in a thunderstorm that is, as previously mentioned, less than 2.5 miles in diameter. Weak updrafts followed by strong downdrafts are a perfect recipe for a severe, albeit short, burst of rain, hail and/or damaging winds. In fact, there are “dry microbursts” which usually contain strong gusty winds, but no rain. Conversely, the stronger the updraft is, the weaker the downdraft, yet as you can see flash floods and hail are not uncommon in these situations. Just amazing how Mother Nature works, huh? For those of you who were hoping this post would lead to an eventual confession that we could be experiencing a microburst soon, I hate to disappoint. So, let me assuage your mind by pointing out that the National Weather Service has discussed the potential of some wandering thunderstorms tonight into tomorrow. Again, the “lift” we talked about will be provided by the Cascades, so that’s the biggest threat, but you never know which ones could trickle our way. The “T”-Rex Block: How is it affecting Kitsap County? According to the poll I conducted on the right hand side bar, many of your are eager to read about things pertaining directly to the Kitsap Peninsula. 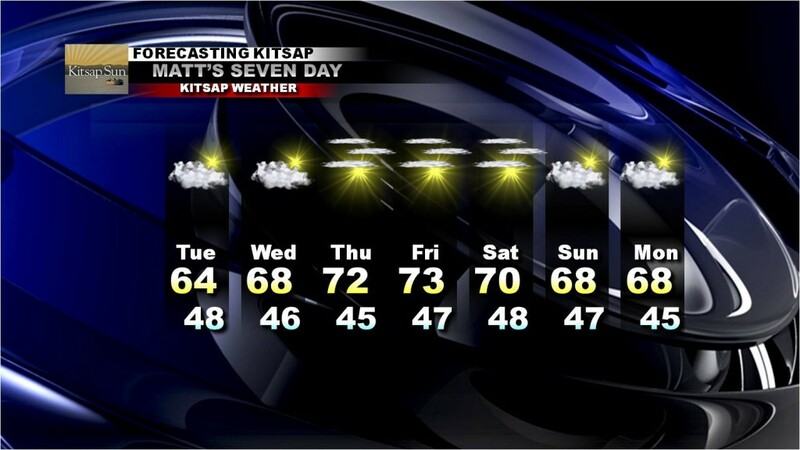 That’s not too surprising to find, as this blog is called “Forecasting Kitsap” after all! But I hope you will forgive me for the lack of coverage of weather events within the peninsula lately, as summer tends to yield the same weather over and over again in the Northwest: sunny skies and mild temperatures. However, as I was reading a forecast discussion provided by the National Weather Service in Idaho Falls (I know, that’s random! ), I noticed they used the term “Rex block” in describing our current weather pattern. I must admit, I wasn’t exactly sure what that was, so naturally I looked up the definition on the NWS site. 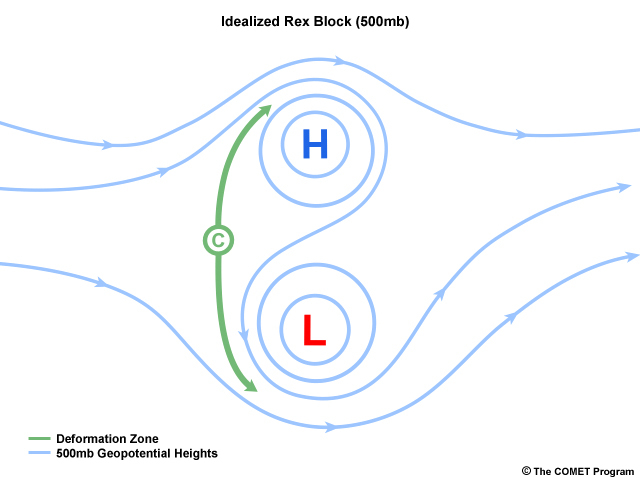 Now, before we talk about the Rex block, let’s discuss what blocking means in meteorology! This is called an “omega block”, primarily because of its shape of the jet stream: Ω. As you can see from the picture, a ridge of high pressure built in the interior west and forced all our would-be active weather up and over our region and sliding it down into the northeast. This is definitely not an uncommon pattern during El Nino years! We get a handful of these “omega” blocks, and…well, my personal bias is…they’re not fun! The area of high pressure (signaled by a small “H” along the coast of western Canada) is directly north of an area of low pressure (situated southwest of LA). This of course is the reason why we’ve been stuck on repeat the past several weeks and the northeast has been so chilly! And it looks like this block will remain stubborn for at least the next week or so. Aside from areas of morning clouds/fog over the next couple of days, we’ll remain largely pleasant with seasonable highs in the upper 60s/low 70s under partly sunny skies. It also looks like we’re still on for a pattern change within the first few days of October. 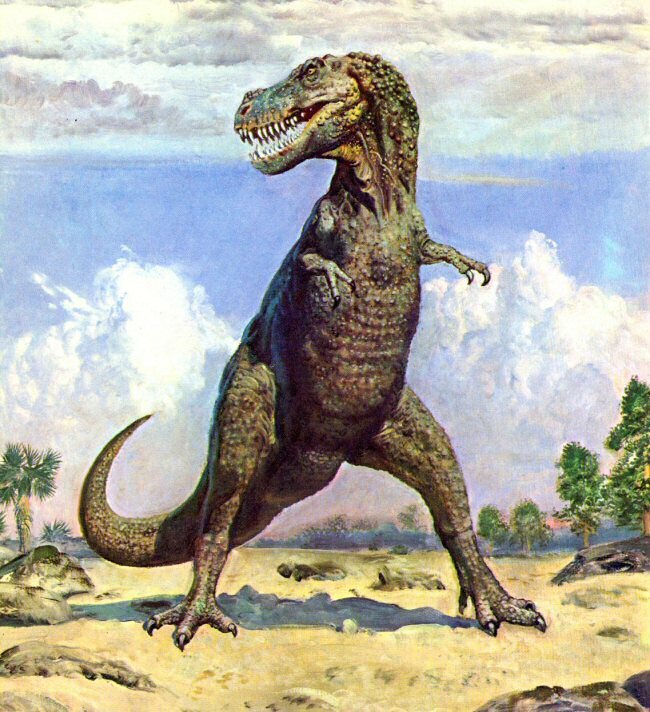 So the next time you have to take a detour, just think of good ol’ Rex! A Forecasting Kitsap reader commented a week or so ago about whether the idea of seasons lagging from year to year is accurate. For instance, have you noticed the summer doesn’t really start until July? And for the past several years it hasn’t ended until late September? Or doesn’t it seem winter won’t really kick in until January and somehow extends until May? Of course I don’t have any scientific information to back the theory up, but somehow I wouldn’t be surprised to learn that we need to tweak our winter and summer solstice a bit, at least here in the Northwest. This theory is ringing particularly true this year. Remember June? How could you not?! It was my first full month back from South Africa and I was shivering from head to toe. Now, it could partially be due to the reason I had just come back from South Africa, but still! It was a dark, wet month. Let’s now compare that to our current state. The temperature right now is 79 degrees! 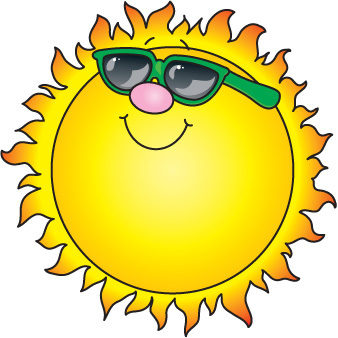 In fact, 12 days out of our 17 so far this month have registered with a high of 75 degrees or above. Then when you add the fact that roughly 85% of the days this month have featured clear skies, the jaws continue to drop. That massive red gob over the Northwest is not usually something snow fans want to see during the winter, although at this time of year we might as well use it up. The above map is color coated depending on % chance. So for instance, we have a 50% chance of registering above normal temperatures in the next 6-10 days. For those who are interested, the 8-14 day forecast, for what it’s worth, is the same. The accuracy of the CPC has certainly increased since I’ve been gone, so I’d bet good money this verifies. So what does that translate for us? Remember, just because the map says “50% chance of above normal temperatures” does not mean we’ll be exceeding 80 every day between now and October. In fact, our daily average high temperature drops every day, even if only a half of a degree. So realistically 80 degrees looks less and less likely each day. Also, these maps don’t tell you how much above average we could be. With that in mind, latest numbers suggest we’ll eventually fall into the mid 70s through next week and cool down quite a bit once October rolls around. 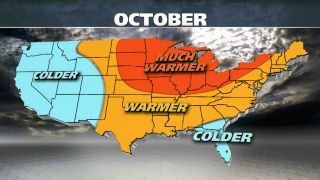 It’s hard to say how cool we’ll get, but fall weather will likely arrive along with October, which is usually the case. For now, enjoy the sunny, mild weather! Good afternoon fellow Kitsapers! Kitsaponians? Kitsapites? 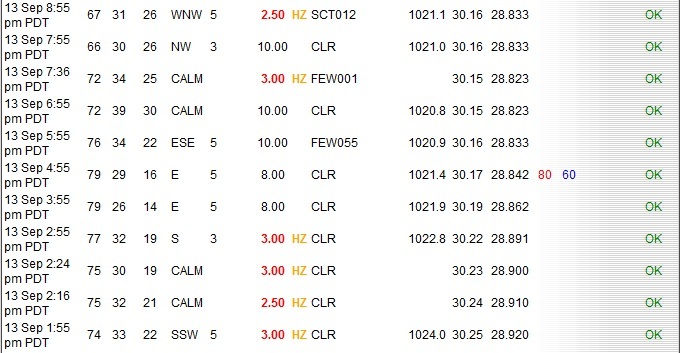 It certainly has been a busy couple of days, especially with the breezy, dry and warm weather we’ve been experiencing. Unfortunately, this is a perfect set up for ongoing threats of wild or brush fires, something I’m sure many of us didn’t even think possible a couple months ago. I am also grateful to hear the Bremerton Airport fire along Highway 3 was contained! It isn’t very common we here of fires on this side of the water. This propelled the smoke north while our northerly winds helped slide it down into our area as well as the Seattle area. Notice how the winds eventually shifted to the W/NW, thus ending our threat or theirs for more major smoke. But then a new wrinkle emerged. 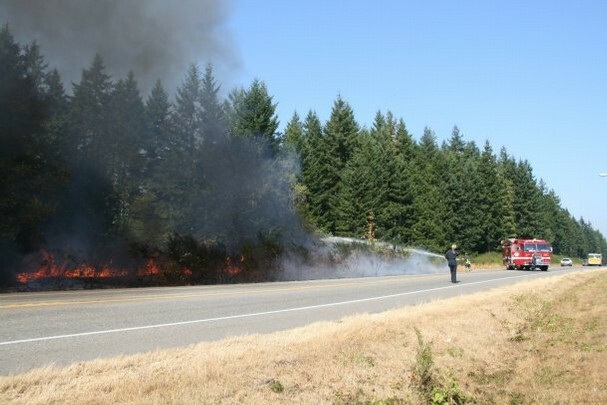 Two brush fires near Bremerton Airport on Highway 3 broke out, which took firefighters 10 hours to battle. As this battle with the fires went on, winds went from blowing northerly to strictly calm. This allowed the smoke to filter over the peninsula instead of being pushed further south. 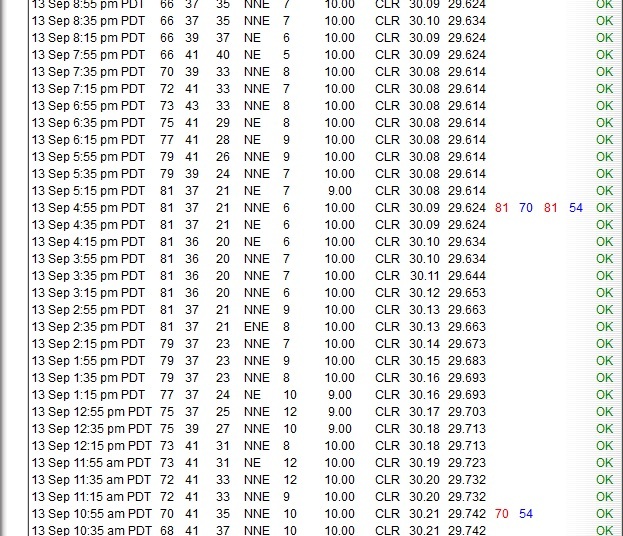 And, as we speak, or at least as of 2:30 this afternoon, winds are again coming from the ENE (click here for the NWS Bremerton Airport weather info) and fires continue to burn in Central Washington, so expect more episodes of wandering plumes of smoke for at least the next day or two. This now leads to air quality. It’s been a little while since we had substantial rain, so where are we sitting? Feel free to visit the Puget Sound Clean Air Agency by clicking here. The current forecast is for moderate air quality today, stabilizing tomorrow as we switch to onshore flow which means we’ll be in the “good air quality” range. Places along the cascade foothills, however, are still in the “unhealthy” zone. 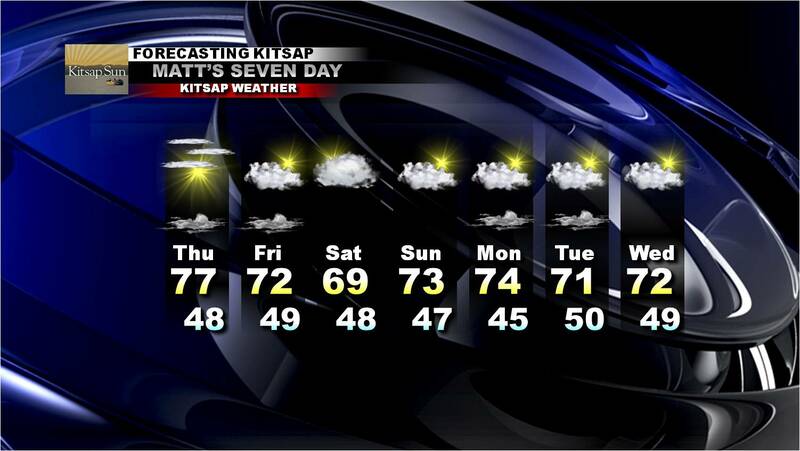 The seven day forecast still looks dry and mild as ever! Currently we’re only running about +.2-+.4 degrees above average, which isn’t much at all. It probably feels a lot warmer than what the numbers are saying, but so far it looks like it’s been a pretty average first half of September! Latest projects show periods of very warm weather with sunny skies for the next 7-10 days. In fact, we could see yet another return to the 80s around the latter part of next week. Have a marvelous weekend everyone! 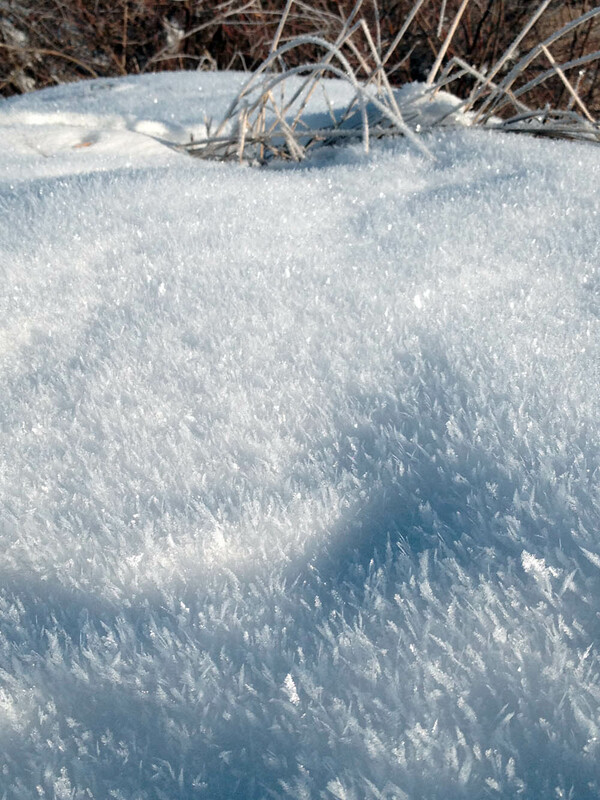 First frosts vs. first flakes: Is there much of a correlation? In honor of the chilly mornings we’ve been experiencing the past few days, I decided to conduct a study that would ultimately prove to be not nearly as exciting as I hoped for, but it’s an interesting study nonetheless. Have you ever wondered when our average first frost is? No? Well…darn. I thought you might. Well, then have you ever wondered when our average first snow is? No?! Really?! Wow…then I DEFINITELY need to share my findings! Ah! What about the time span in between the first frost and first snowflakes! Surely that will tell us something! Well, not really. In fact, 5 years are two months apart, 5 years are 1 month apart and one year is a week apart (2007). Drat! Looks pretty 50/50 to me. Let’s analyze the colors for a moment. Blue indicates La Nina years while Red indicates El Nino years. This beautifully illustrates what these weather patterns do to our winter climate. Since 2007, La Nina has made more frequent appearances, and in all these years the frost came right on time (mid October) and the flakes followed shortly after. Conversely, look at the El Nino years. Aside from 2006’s anomaly, the flakes seemed to come consistently later. 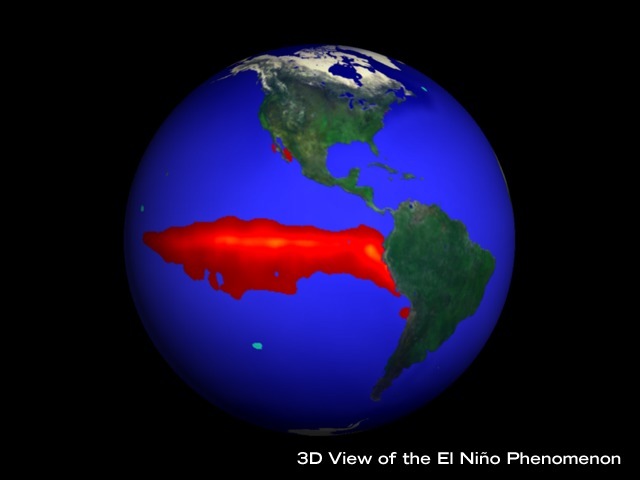 Yes, this is an El Nino year, but not a strong one, so we could go either way. But a closer look could reveal something maybe only moderately intriguing. Then again, I get entertained easily. From 2001-2007, on average the first frost occurred at the end of October. Notice how from 2006 we get an earlier frost every year until 2009 where we peak at the earliest frost on record in the past 10 years: 2009. Then watch what happens after we hit 2009. 2010 we drop to Oct 14th, then on 2011 we drop to October 16th. Do these numbers look a little bit like a wave to you? The first snows in each of these years, however, never seemed to come any earlier. In fact, these records show that pinpointing a first snow is still very much a gamble in this area, however if one insisted on betting I think sometime in November during an non-El Nino year would be a good shot. So that begs the question: when are we going to get our first frost? 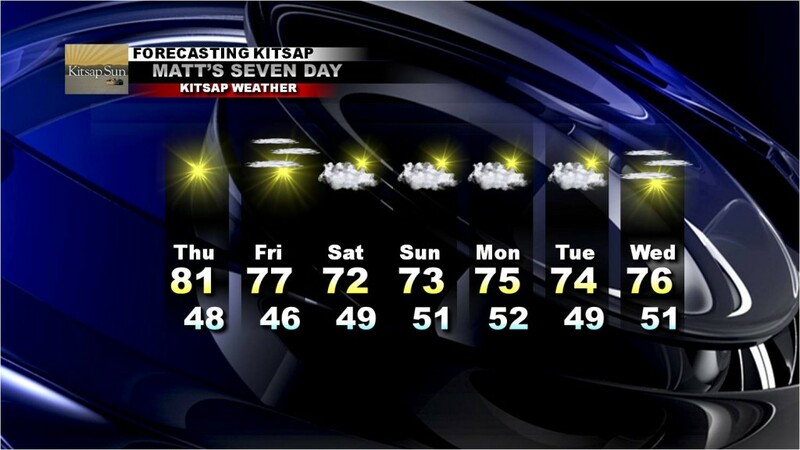 According to the data I’ve received (which seems almost more like a mix of random numbers than a trend) I would go out on a limb and predict we’ll see our first *recorded frost in the Kitsap area in mid October, say sometime a little after the 16th. Enjoy the rest of your week, everyone! We are well on our way to possibly reaching the 80s yet again on tomorrow. Ah, the Old Farmers Almanac. Despite its name, these annual long range forecasts never get old. Reading more into the logic of their long range forecasting, the New Hampshire based company claims to derive its skill “from a secret formula that was devised by the founder of this Almanac, Robert B. Thomas, in 1792” which admittedly has been modernized as time and technology continually press forward. 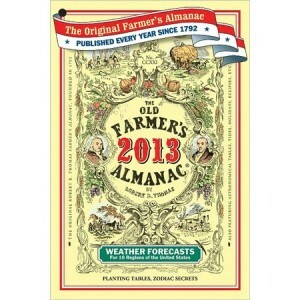 I’ve been fascinated by the Old Farmers Almanac since my earliest days of forecasting. Of course, I’m not very advanced in years and couldn’t tell you how accurate they have been over the decades, but the almanacs that I have dating back to 1997 have been fairly accurate. But what can you expect from a super long range forecast? Anything above 50% is impressive to me in my book! In fact, if you’d REALLY like a sneak peek into how accurate the almanac was last winter, read Scott Sistek’s thorough analysis. So what are the trusty farmers calling for this year, you ask? Perhaps it doesn’t surprise you there are a few stray elements of El Niño in the forecast, but it won’t be your typical El Niño. Yeah, it’s looking milder and drier than normal, but consistently through the winter. “Winter time temperatures will be a couple degrees above normal, on average,” the almanac states. “Rainfall will be below normal, while snowfall will be near normal.” In fact, the almanac is predicting a nice little snow event for Western Washington a week or so before Christmas. This is also good news for skiers, as the snow pack likely won’t suffer. Aside from a few snow possibilities sprinkled throughout the year, temperatures during winter 2012/2013 are forecast to average two degrees above normal with the exception of February, which could average as much as six degrees above normal. Precipitation will also be quite low, with December possibly averaging as much as three inches below normal. A scan through the almanac’s detailed forecast for 18 regions of the U.S. reveals an interesting trend, however: this looks very much like a typical El Niño set up, although it looks like most places in the U.S. will be experiencing drier winters, which isn’t typical for the southeast during this type of pattern. Take from this long range forecast what you will! I have been compiling some information the past few days and will release a fall forecast soon. So let me take a random stab in the dark and guess many of you are happy to see temperatures in the mid 80s exiting the 7 day forecast. 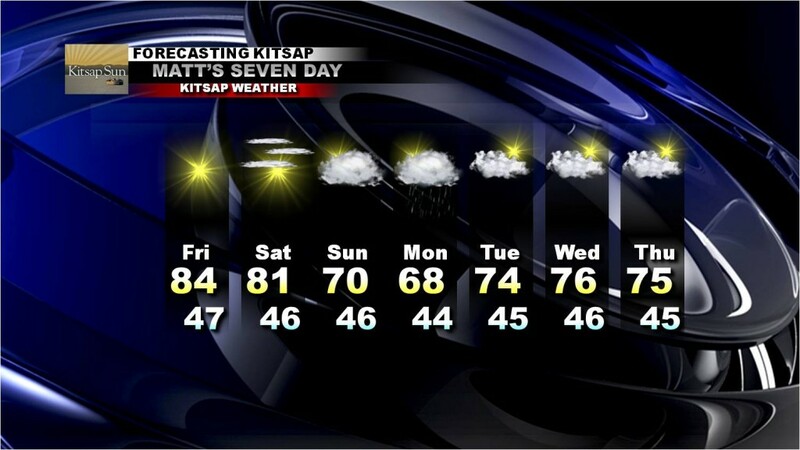 Did you know Bremerton Airport recorded a high of 88 degrees on Friday? Sea-Tac airport broke a record with 90 degrees. 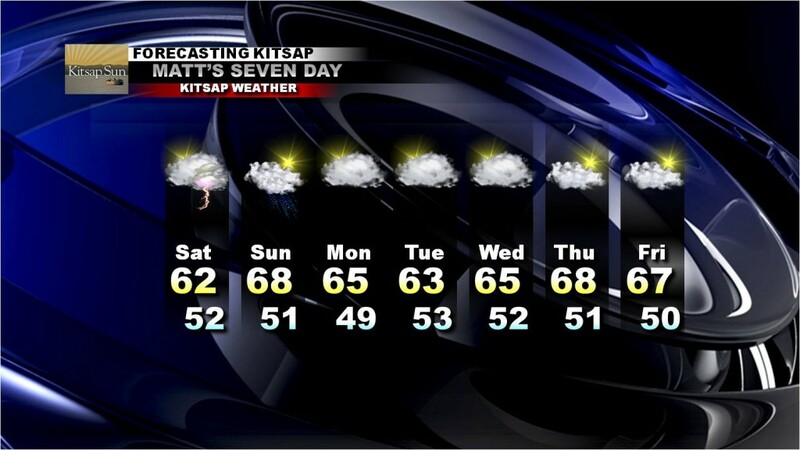 So I guess my risky prediction still holds: we on the Kitsap Peninsula will likely not see 90 degrees again until 2013. The last weak El Niño we had was in 2006-2007, which offered some record cold, flooding and warmth along with an incredible skiing year, so the weaker the better! In fact, it’s very probable we remain “neutral” until the official onset of winter which means largely a wildcard weather pattern until then. Stay tuned to the NOAA website for further updates! The short term looks drastically colder and wetter. You may have noticed the cooler temperatures and increase in cloud cover today and it will only get cooler and cloudier from here. Your Sunday looks mostly cloudy with a few scattered showers increasing in the evening. Highs will decrease from the upper 70s today to the mid 60s tomorrow. Monday will be another cool and showery day with highs in the low and mid 60s. And while these weather days may feel more like a Washington fall, the skies will clear yet again and highs will rebound to the mid and upper 70s throughout the week next week. 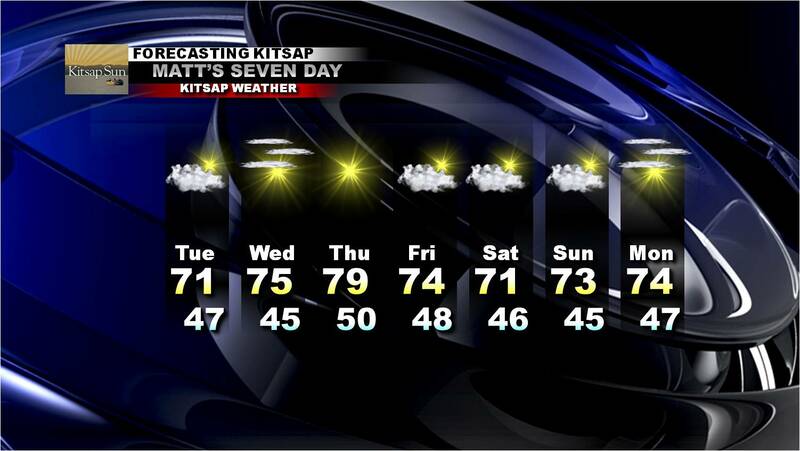 For most of us, the weather this upcoming week could be termed as “perfection”. The long range forecast looks like continued dry and mild weather with no real end in sight. In fact, by the third week or so of the month we’ll probably average out in the low to mid 70s for highs. Overall, we’re looking at quite an impressive streak of mild fall weather! Will this be summer’s last “hoorah”? After a summery high of 82° today, many are probably thinking, “Well surely this is it. It’s September after all, and days in the 80s are usually hard to come by!” While it is true that such temperatures are much above or daily average high, which usually settles in the upper 60s/low 70s this time of year, it is not so uncommon to see such temperature readings, even late into the month. AT KSEA (SEA-TAC AIRPORT RECORDS) THERE HAVE BEEN TEN 90 PLUS DEGREE DAYS IN SEPTEMBER SINCE 1945. THE RECORD AT KSEA IS 94…THE CURRENT FORECAST OF 86 WOULD BE A TIE FOR THE SECOND WARMEST SEPTEMBER 7 SINCE 1945. At face value, these temperatures will yield temperatures *only* in the mid 80s, perhaps even upper 80s in spots, but considering the time of year this will be a hot one. Saturday and Sunday will be a gradual transition to cooler, cloudier weather. Highs will eventually dip into the upper 60s and low 70s Sunday and Monday with mostly cloudy skies, and we may even see a few showers late Sunday into Monday. Still interested in brightly colored fall leaves? Then you’ll absolutely love the weather for next week. As it stands, we’ll rebound to slightly above normal high temperatures, cool low temperatures and fairly sunny days. So as far as tomorrow being summer’s last hoorah, I think the chances of us getting well into the 80s again are growing dimmer by the day. After all, the first day of fall is in just a couple weeks!